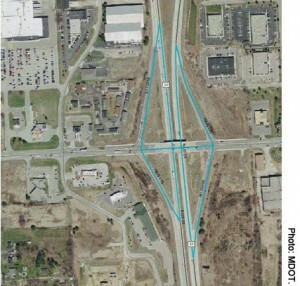 A highway exchange – arable land or poisoned ground? 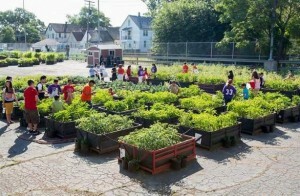 Road verges, boulevard medians, abandoned parking lots and highway ramps are favorite targets for urban gardeners. It’s nice to think of these brown and gray areas becoming green again, or even festively bright with flowers, fruits, and vegetables. This is definitely a brilliant goal, and it’s well worth pursuit, but there are some considerations that urban gardeners should make in many cases. The weight of cars and trucks compresses the soil, reducing the ability of air and water to penetrate. Plants need both air and water. Traffic can kill plants, reducing the amount of organic matter that is being introduced by root systems and decaying leaves. The weight of car and foot traffic can kill soil fauna like worms and beetles. These animals mix and aerate the soil. Lead in gasoline was deposited along roadsides as the exhaust is released. Lead was added to gasoline from 1922 – 1990. Yikes. That’s a lot of lead in the soil and waterways. Soils cling fast to multivalent metals like lead, and plants are pretty good at extracting it- so the lead from the tail pipes may end up on your dinner plate. Other metals such as arsenic are also an issue in urban soils, and there may be more depending on the site history. Areas adjacent to buildings are loaded with lead and dangerous metals found in old paints. The metals leach from the siding over the years into the soils near the building. As a gardener, you’ll need to consider what will grow, what should you grow, and can you eat it? 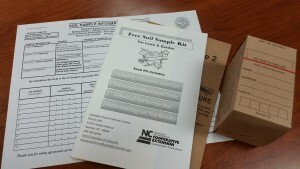 An example soil sampling kit. Not all urban soils qualify as Superfund sites, honestly! But if the area in question has a long history of exposure to exhaust or industrial use, just have it tested for lead and other metals before eating vegetables from it, especially leaf and root crops, which tend to accumulate metals in significant quantity. Having your soil tested is interesting, and easy! On the internet, search “Agricultural extension, soil analysis, [your state].” Some links to various Ag programs at Land Grant universities in your region should pop up. Tests are less than $20, some are free (as of this writing, tests in Pennsylvania are $9 – $15). Basically, you put some soil in a baggie and send it off to a lab. They send you the results in a couple of weeks. They will also do additional tests such as carbon, nitrogen, particle size, and basic nutrients. University of Minnesota reports that 300ppm total lead is usually considered safe for growing food. Over 300ppm Lead, or dangerous levels of other metals? What if your heavy metal levels are unsafe? That’s a tough question. Phyto-remediation is a technique whereby plants that are hyper-accumulators of metals (like sunflowers, among other common crops) are grown on contaminated soils, then expertly removed and disposed of. The soil is left cleaner to some degree. It’s a nice idea, but if you give it a try in the DIY spirit, the issue then becomes, what do you do with the toxin-laden plants after they are culled? What happens to the animals that eat the seeds? You’re burdened with a load of toxic vegetation that’s no good for eating, composting, or burning. You’ll be a part of a different problem if you landfill it. Maybe, until a better solution is available, it’s best to let the soil hold on to it. If you’ve got unsafe lead or arsenic levels, it’s just not a safe DIY project without in-depth knowledge and the right resources. Best to call in the pros or ask your local Ag-Extension folks who did the soil testing for specific regional recommendations. They might be able to provide some nice options for gardening with plants that are not significant accumulators of contaminants, have alternate sites to suggest. They may even be able to recommend grant agencies to help cover professional remediation. But, if you’re utterly Jonesing to grow veggies and you’re parked on a Superfund Site, you do have some more immediate options. Build a deep raised bed and put a heavy water-proof liner at the bottom to prevent the roots from reaching the contaminated soils. If you use reclaimed lumber, avoid wood that is painted or treated wood over 5 years old, it may contain arsenic. Grow a vertical garden with hanging containers of clean soil. Grow in large containers like 55 gallon drums. Don’t be dismayed, just recognize the danger and work to garden your land safely. We’re living with a legacy environmental issue here, so your creative and safe work-arounds may help future generations! I tested, and hey! My soil’s SAFE, let’s get started! 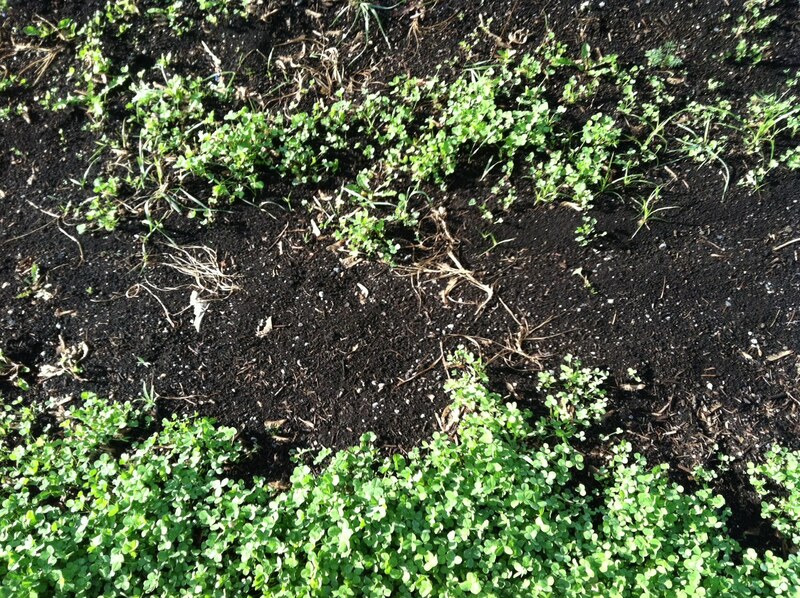 Clover (Trifolium repens) establishing in a compost/cardboard layer over salt impacted soil in my suburban yard. Awesome. Here are some steps to get your soil into a semi-functional state. Remove debris. Garbage, sticks, nails, rebar, glass, inconveniently large rubble, etc. Pull up patches of sod and weeds where you’ll be gardening. These will compete with your plants. Loosen compressed soil. If you can’t use a shovel, use a pick. Note that moistened soil will break up – and compress – more easily. Incorporate organic matter. For urban areas, I recommend well-aged compost. Young compost will attract vermin; vermin attract complaints. For small areas, you can incorporate a lot of compost for little money. Don’t purchase compost at your big box store, see if you can get several large tubs from your county’s lawn recycling facility. “Mushroom compost” is okay; it has few microbes, and so it will take a while for it to really become an active part of the soil. Add earthworms, if you didn’t see any already present. There are different kinds of earthworms, some only like the compost, some live in the mineral part of the soil and mix organic matter into the soil- these are the ones that you want. A good way is to dig for worms in a nearby area and re-locate them. If they are happy, they will reproduce. Another technique that I have used with good success is to lay a couple layers of corrugated cardboard (remove tape and staples), then 6″-8″ of well aged compost. The compost will likely have earthworms in it. The compost will smother the weeds, mostly…, and the worms will gradually integrate the organic matter into the mineral soil. 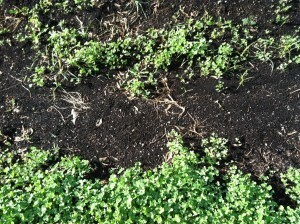 I used clover a ground cover until the surface was stabilized from erosion. Clover is fairly easily removed and makes a fine nursery crop. 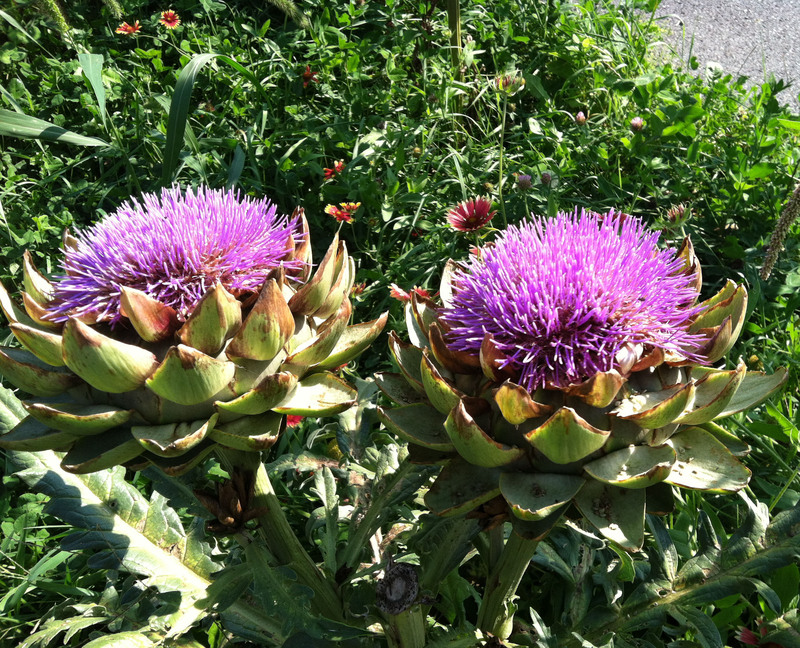 Start with plants that grow fast and are tolerant of less-than ideal conditions. Artichokes blossom with Gaillardia in my free-spirited road-side garden. Cruciferous veggies are greatly varied and easy to grow: Radishes, broccoli, kohlrabi, cabbage, arugula, turnips and beets, kale, etc. Lettuces grow quickly, easily, and are tasty. Spinach and tomatoes are fine, but can be difficult to grow and are vulnerable to a lot of diseases when in less-than-ideal conditions. Beans and peas HELP the soil! They have a symbiotic association with soil organisms that pull nitrogen from the air and adds it to the soil. Peas and some beans require a trellis or fence to climb. There are bush beans that need no trellis. Cucumbers and zucchini are great and can sprawl if not given a place to climb. These veggies often produce much more than a family can eat and are easy to pick- an awesome trait if you hope to share! Bush varieties are also available. Have fun, be knowledgable about your soil, and enjoy entertaining the questions and sharing the bounty that come with urban gardening!